This section of the Source Page provides a closer look at what the GTAs consisted of, content-wise. Being the top Firebird model, the GTAs were heavily equipped from the start, but each year saw additions and deletions from the standard and optional equipment lists. The brake horsepower ratings for the L98 engine varied between 210 HP in 1987 and 240 HP in 1992, with torque ratings from 315 lb./ft. in 1987 and 340 lb./ft. in 1992, the GTA's last year of production. The LB9 engine had different horsepower numbers depending on the transmission selected; these numbers are fully covered in the Technical Specifications section. For 1991 and 1992, there was a performance option available for the TPI twins through the GM Special Parts Operations (SPO) branch. Developed by Street Legal Performance, Inc. (SLP) of Toms River, NJ, these packages were available through dealer parts departments and could either be dealer or customer-installed. This package is fully covered in the Technical Specifications section as well, but resulted in a gain of 50 HP @ 5500 RPM, with corresponding torque increases from 2800 RPM up through the power band. 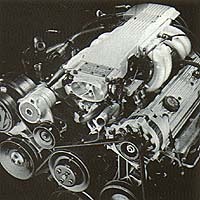 Of additional note was the only OEM engine ever to power a GTA besides the TPI V-8s: the 1989 20th Anniversary Indianapolis Pace Car's RPO LC2 3.8-liter V6 Turbo, which was the result of a joint venture between Pontiac and PAS, Inc. 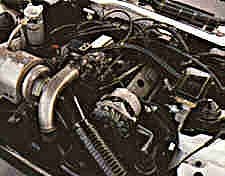 This engine was a semi-transplant from the then-recently-retired Buick Grand National Regal and only Pontiac (with apologies to Chevrolet) was able to slip and scheme around to garner the use of it. The 3.8L SFI Turbo was rated at 250 HP and 340 lb./ft. of torque in 1989, which was, at best, a very moderate estimate............ 1989 was the only season it would see duty in the Firebird line and then only in the 1,555 Pace Cars. The standard suspension for the GTA was the WS6 Level III Performance Suspension. Dating from 1978 and one of the few "legendary" codes still in use on the Firebird line today, the WS6 package has always been the top-line suspension set-up for all Trans Am models, and the GTA set-up was no different. WS6 features included 36mm front and 24 mm rear stabilizer bars, special Delco gas-charged shock absorbers, specially- tuned coil springs (96 lb./inch front and 23 lb./inch rear), four-wheel disc brakes, limited-slip rear axle, and a special 12.7:1 ratio steering box. Putting all this suspension to the ground were Goodyear's Eagle VR50 radials. 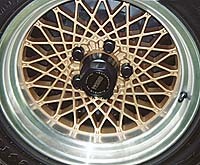 The "Gatorback" tires were sized P245/50VR-16 and mounted on 16"x 8" gold, diamond-spoke aluminum wheels specific to the GTA (RPO PW7); the hub caps were black and usually had a "WS6" call-out on the center. The wheels were unique in that the rear ones were offset 16mm due to the rear axle width; the front rims were zero offset. 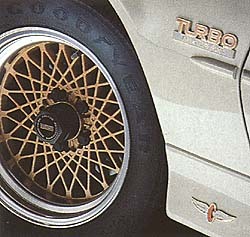 In 1989, Pontiac engineers upgraded the tires to ZR speed ratings (above 150 mph), but stayed with Goodyear's Eagle performance radial series, despite pressure from Firestone and Bridgestone, who supplied some tires to the lesser Firebird models. The 16" gold wheels remained throughout the GTA's entire production run of five years. Trans Am GTAs fall into two distinct appearance groups: 1987-1990 and 1991-1992. The 1987-90 models carried on the styling first introduced to the Firebird line in 1985; this year was the first year that the TA's aero kit was a designed-in part of the car instead of an add-on option. The 1991 changes were actually introduced in the spring of 1990 (hence the short 1990 model production) and implemented aero elements seen on the Banshee show car of the year before. Now the aero kit had been transformed into a sweeping array of flares and spoilers, which had functional purposes as well. The only odd functionality result of the restyle was the fact that the new aero rear spoiler actually caused the rear of the car to lift at high speeds. Styling elements were also slyly incorporated to give the public a peek at the direction of the fourth-generation Firebirds due in 1993; the GTAs, despite the renderings of designers, were not destined to carry over to the new generation. On all GTA models from 1987-92, though, the exterior ornamentation remained the same. GTAs used body-colored epoxy-filled emblems rather than tape stripes and decals. A gold Firebird could be found on the rear sail panel. 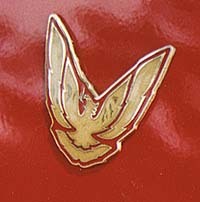 A gold GTA/Firebird combination crest was placed on the nose of the car between the headlights, and "GTA Trans Am" badges were located above the body break line at the back of the front fenders. GTAs did not feature the lower air extractor vents like those used on regular Trans Am models. A side note here........... the 1989 20th Anniversary Trans Am had "Turbo Trans Am" emblems on the fenders, "20th" emblems on the nose and rear pillars instead of the usual GTA emblems, and "Indianapolis Motor Speedway" logos on the lower front edge of the ground-effects behind the front wheels. Whereas most people do not think of the 20th Anniversary cars as being GTAs, they were, in fact, referred to in PMD literature as GTA-based models and are thus included here as well. These special cars shared all the GTA trim levels with the exception of slightly modified rear seats, an instrument-cluster mounted turbo-boost gauge inside the tachometer face, and the afore-mentioned badging differentations. A monochromatic paint scheme was the only paint option for a GTA buyer to choose from; the two-tone Trans Am color scheme was not offered. In fact, the popularity of the GTA's paint scheme prompted PMD to begin pushing the same option on the Trans Am in 1988, even though it had been available since 1985. The only exterior option available was a removable, locking hatch roof (RPO CC1). Pontiac was supposedly seeking an older, more upscale clientele for the GTA and so they initially tried to discourage the installation of the hatch roof. PMD saw the problems of chassis flex looming over the horizon (especially on cars with the L98 engine), but eventually bent to public pressure and began installing them on more and more cars through 1990. Beginning in 1991, no Firebird with the L98 motor could be equipped with the T-Top roof (except for the 1992 Formula with the 16' x 8" PW7 diamond-spoke wheels........? ), so only the 5.0L GTAs could have them installed. The only other exterior option was the short-lived GTA Notchback of 1988-89. Seeking something to further differentiate the GTA models from the rest of the Firebird line and in an attempt to lessen the "greenhouse effect" from the big rear hatchback glass, GM came up with the idea of an optional flat-glassed rear notchback hatch lid (RPO AA8), similar in appearance to the 1968-1976 Chevrolet Corvettes. Beginning in December of 1987, this was a GTA-specific option and could not be ordered on any other Firebird (or Chevrolet Camaro model). Production records show a total of 625 units were built during 1988 and 1989. The option was actually canceled before the start of production for 1989; a dealer bulletin in August 1988 announced its demise, instructing dealers to recall any and all GTA orders with the Notchback code on them. Still, PMD records show that one single car was built for 1989........ no doubt the car pictured above from the 1989 Pontiac brochure. Today these GTAs are very rare sights and are highly collectible, even though the style really did not catch on during their brief production run. These cars were the only GTAs not to use a variation of the rear aero-wing spoiler, since the notchback design changed the layout of the hatch lid. PMD engineers simply installed the standard flat Firebird spoiler instead of the usual aero-wing unit. Also of note here was the aborted attempt by PMD to garner support for the introduction of the GTA Sport Wagon, a Kamm-based sport wagon design that originated during the run of the second-generation Firebirds (1978), and first re-surfaced during the third-generation Firebird run on a 1985 WS6 Trans Am in Motor Trend magazine. The option consisted of a framed fiberglass hatch mounted to the rear of the car in place of the standard glass hatch. Yet another interesting side note in the GTA's history was the production of a small number of GTA convertibles for 1989 by ASC, an aftermarket conversion company, in cooperation with Pontiac. To travel in a GTA was to travel in the most luxurious F-body model available in its day. GTAs featured many specific options not found elsewhere in Firebirds OR Camaros. 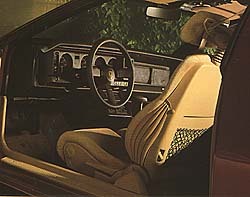 Standard seating consisted of specific "Ultima" articulating bucket seats covered in Metrix cloth trim. These seats were fully adjustable fore and aft, featured full manual recline, adjustable thigh supports as well as headrests, and power-inflatable bladders for both lumbar and lateral support. In fact, these excellent seats continue in the Trans Am even today, with only the headrest design being different. 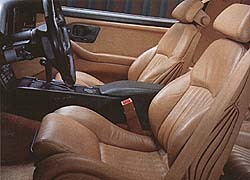 A "Ventura" leather seat trim option was available (interior color codes ending in "28") and, paired together with the hatch roof, made up the R6A GTA Value Option Group through 1992. Most non-hatch roof cars came with the Metrix cloth trim, although the leather trim was available seperately as well. The other interior option consisted of a Digital Instrumentation Package (RPO U52), which also required selection of the Electronic A/C controls (RPO C67). 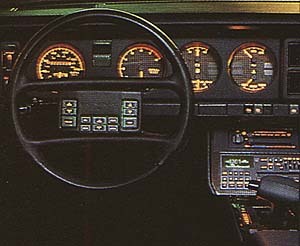 The digital instrumentation did not feature any added displays over the standard analog set-up, but did add a futuristic feel to the interior, ala the early 1980's television show Knight Rider. Standard GTA instrumentation included everything necessary for monitoring the machine and its condition. Present and accounted for were a large 7000-rpm tachometer and a 140-mph speedometer; secondary gauges were provided to monitor fuel levels, voltage, oil pressure, and water temperature in a seperate cluster. A seperate interior roof console was available for 1987 (RPO DK6) which featured storage for sunglasses/garage door opener, a analog trip computer, a swivel map light, and even a rechargable flashlight for emergencies. Audio sources received equal attention to detail in order to surround the driver in a fitting atmosphere. Beginning in 1988, PMD added as standard equipment the top-line audio system (RPO UT4) which consisted of a touch-control AM/FM stereo tuner with five station memory preset, full seek and scan, an auto-reverse cassette deck with dual-direction track search, a five-band graphic equalizer with which to fine-tune the sound, built-in radio and tape noise reduction, and a digital clock. 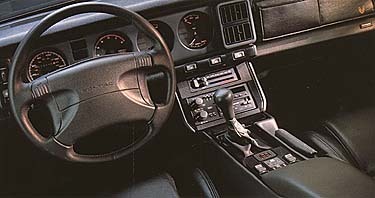 Also standard were radio controls on the steering wheel. Functions mounted there included AM/FM selection, volume, radio seek/scan, radio tune, pre-set select, recall, fade, and mute. The MUTE button was especially important because it was the key to the new Delco-Loc radio theft-deterrent system. This button was required to power the unit back up if it was stolen; therefore the radio could not be installed in a vehicle without the steering wheel radio controls. If a thief tried to re-install it in another car, a LOC message would show on the display window and remain there until the MUTE button was pressed. GM brought the RPO U1A CD player on line in 1989 and it became the top audio option for the GTAs through 1992. The UT4 stereo cassette unit was standard until 1990, when the first use of Supplemental Inflatable Restraints, or "airbags" required the deletion of the steering wheel radio controls in order to make room for the airbag, and the stereo was discontinued. 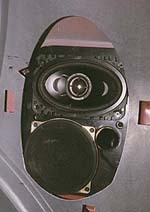 To supplement the factory sound system, PMD also offered a subwoofer speaker system (RPO UQ7) for the GTAs. This system was developed in conjunction with the auto-sound giant Blaupunkt and was optional on several other Pontiac models as well. The UQ7 system featured two 4-inch subwoofers mounted in a sealed rear enclosure with two 4 x 6 speakers, plus two more 4 x 6 speakers in the front dash. A small amplifier of around thirty (30) watts powered the subwoofers seperately and they also had a seperate on/off GAIN control lever on the dash with which to adjust power output as well. GM changed radio harnesses for 1989 and also incorporated rear shoulder seat belts into the Firebirds; in order to maximize room for the new belts and their additional hardware, the UQ7 option was dropped.